Wader Quest: Critically Endangered waders. The list of Critically Endangered waders makes grim reading; Black Stilt, Jerdon's Courser, Sociable Lapwing, Javan Lapwing, St Helena's Plover, Eskimo Curlew, Slender-billed Curlew and Spoon-billed Sandpiper. 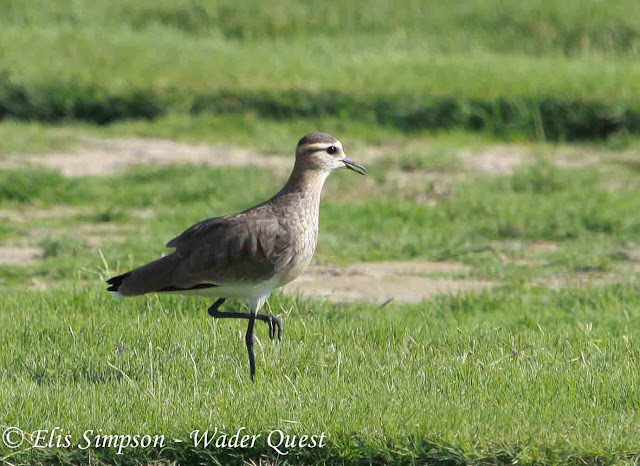 Of these Jerdon's Courser, Javan Lapwing, Eskimo Curlew and Slender-billed Curlew are almost certainly already extinct. Jerdon's Courser Rhinoptilus bitorquatus has not been seen since 2009 when two were seen in Andhra Pradesh. However extensive camera trap surveying between 2010 and 2012 has not found a single bird since that time. A faint glimmer of hope lies in the fact that an egg found in 1917 has proven to be of this species beyond the known range of the bird (Andhra Pradseh and extreme southern Madhya Pradesh, India) and may mean the bird continues in existence where it has not previously been extensively looked for. Javan Lapwing Vanellus macropterus was only ever found on the Island of Java, Indonesia for sure. This was a bird that was never abundant it seems and its habitat has been turned relentlessly into aquacultural and agricultural use leaving it with no space to thrive. Added to which it was almost certainly hunted. It has not been recorded since 1940. Studies carried out between 2001 and 2012 failed to find any individuals although there are some unsubstantiated reports from locals. There are areas that have yet to be surveyed and it is now thought that its habitat requirements were not as rigid as first believed so there is a chance the bird may still be hanging on in some remote corner of Java, although it is unlikely to be found within its previously known range. Eskimo Curlew Numenius borealis is perhaps the most celebrated of these probably-extinct species due to its incredible former abundance. It is widely known that excessive hunting reduced the numbers of this bird between 1870 and 1890 but it did not recover when its hunting was banned in 1916. This would suggest that it is just as likely that its decline was exacerbated if not caused by the destruction of the prairies. The last proven record was in 1963 when a bird was 'collected' although occasionally unproven reports still persist, the last being in 2006. Slender-billed Curlew Numenius tenuirostris is another species to disappear from the radar in relatively recent times. The last record accepted by a national committee was in 2001 in Hungary. This too was once a common bird it seems in the early 19th century but it had become rare even as early as the beginning of the 20th century. Right up to the mid 1990s a small group persisted in Morocco and were seen by many observers, sadly I was not one of them. Since they disappeared there have been other sightings of individuals or groups of up to three and there is a slim hope that some of the more under watched regions that the bird passes through may still harbour a small population clinging to existence. That leaves us with the extant Black Stilt of New Zealand, Sociable Lapwing of Asia, Europe and North Africa, St Helena Plover on the South Atlantic island of the same name (which is probably better known for being the place of Napoleon Bonaparte's incarceration following his defeat at Waterloo) and of course our beloved Spoon-billed Sandpiper. 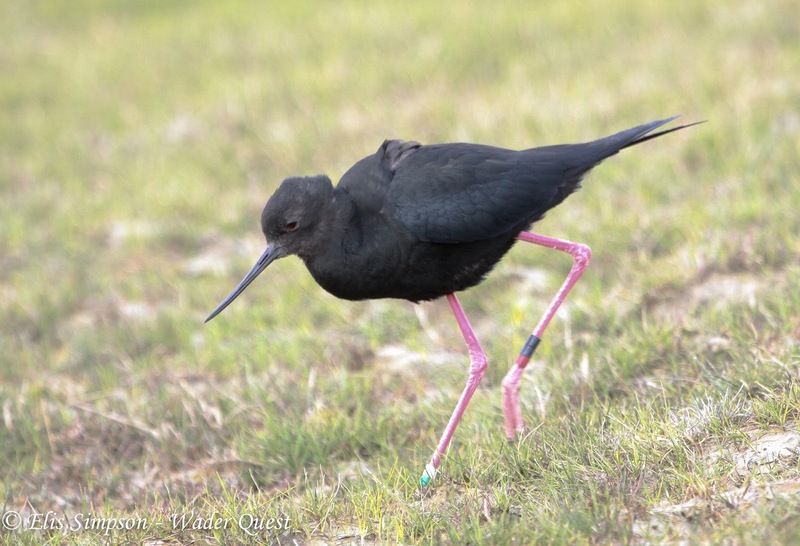 Black Stilt Himantopus novaezelandiae is, if you accept that the other species above are extinct, the rarest wader in the world. At one point in 1981 there were just 23 birds in existence. An intensive management plan was then put in place and includes a captive breeding programme. In the season 2007/8 there were 20 pairs and 78 adult individuals in the wild. In 2012 before the captive bred birds were released (70 birds) there were around 130 free flying individuals. Many of these though are from captive stock and non breeding. A further complication for this species is that when it is released it often cannot locate another of the same species and so will hybridise with the White-headed Stilts Himantopus leucocephalus diluting the gene pool. If the management of this species and the captive breeding programme were to cease it is doubtful that the species would survive independently. Sociable Lapwing Vanellus gregarius is a bird that has suffered a steep decline (50% between 1960 and 1987) having fallen by 40% from 1930 - 1960. 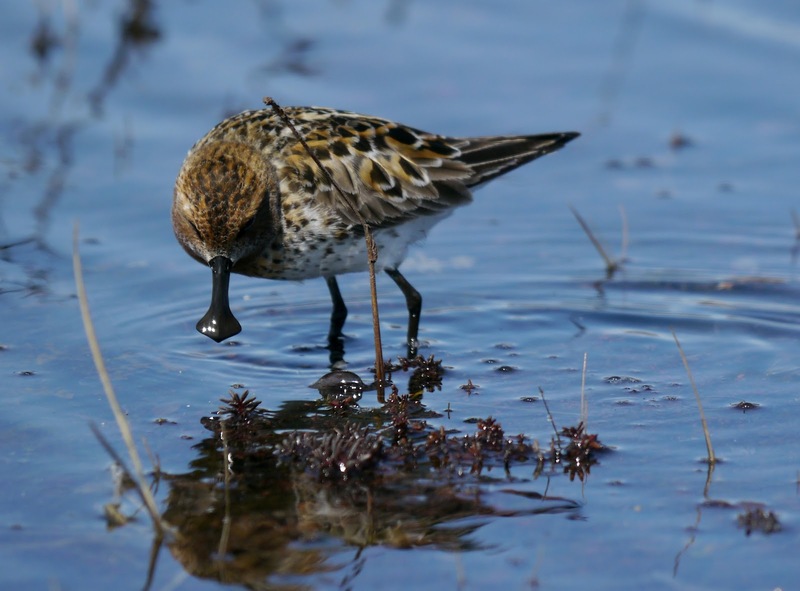 However, more recent studies show that the population may be bigger than it had been feared when a tagged bird was found in a large aggregation of this species totalling 3,200 birds. This total was larger than all the other counts added together in Syria and south-east Turkey. What has caused this decline is not altogether clear, but it is likely that habitat change either by conversion to arable from grazed steppe or regeneration of ungrazed steppe from abandoned arable land is a major factor. Where human habitation exists in the birds' range they tend to be close by. This may be because of grazing animals creating suitable habitat but this in itself may cause a danger by increasing the risk of nest destruction due to disturbance or trampling. Currently a major threat is hunting during their migration especially through the Middle East. St. Helena Plover Charadrius sanctaehelenae is endemic to one island in the South Atlantic and as such is vulnerable to all sorts of threats including introduced feral predators such as cats. But this is not the end of this species' problems. The birds have depended for many years on grazing pastures but this activity has declined greatly reducing the suitable breeding habitat available. This, together with encroachment of non-native plants, means the breeding habitat is being diminished. Add to this the threat of an airport and a recently built wind turbine project covering 20% of the breeding area that appears to have no mitigation stipulations placed upon it it seems that although the birds appears to be slightly increasing its population due to managed land use, it is still under threat from all sides. Sadly we haven't seen this species, so this museum specimen is the best we can manage of St Helena Plover. Spoon-billed Sandpiper Calidris pygmea has been written about at length in the last few years so there can be few who are not aware of this bird's problems. From potential climate change issues on the breeding grounds, destruction of the flyway that it uses and hunting on the wintering grounds are all cause for concern. The latter of these three is being addressed with projects offering alternative employment to hunters in poor villages near the wintering quarters. A captive breeding programme has been established, but as yet it seems the birds have not bred in their first two seasons. A more productive rescue plan seems to be the 'headstarting' programme that is being carried out on the breeding grounds. Eggs are taken from nest (the adults lay a second clutch) hatched and then reared in captivity until they fledge at this point they are released from their sizeable aviaries on the tundra and they join their wild congeners. One such bird has been shown to have migrated and returned to breed, producing offspring.